Rumor: First Windows Phone Update will "do what took Apple three years"
"Microsoft is committed to delivering regular updates to the Windows Phone experience. Our first update will make copy & paste available in early 2011. In addition to this first update, all Windows Phone 7 users should expect to see additional updates delivered in the future as part of Microsoft's ongoing update process." Stay tuned for more information and leave your most wished items in the the comments below! In the "Month" view an excerpt of the appointment title not "Welcome to Seattle"?!?!?!?!?! Unified inbox, seriously get this one sorted!!! Messenger app. Think Whatsapp, but integrated. Be able to send a (data-) message to any contact. Hell, buy Whatsapp!! Seriously though I'd like to see better multi-tasking. Even tomb-stoning (that phrase has been thrown around a lot recently) would work great for me. Just give me a way to get back to an app without having to completely reload it! Actually it does support tombstoning (returning to the previous state of the app) by using the back button. It works for most apps, just back into it and you will not have to relaunch it. I was pretty happy to find this feature as it is very useful. It works for most apps. Here is a link for more info. Tasks and multitasking would be nice, but I want to sync with my OutLook via activesync. Hell Apple, Android, and BlackBerry sync with OutLook! I was ready to actually slap some $$$ down and get a WP7 device and someone told me it did not sync with OutLook (I know it sync's with Exchange). Told them they did not know what they were talking about and come to find out they were right. I was dead set about not ever getting a WP7 phone till I actually played with one. I won't use the WP7 phone for email that much, more with the PIM side of OutLook. This is a deal breaker for me, I'm really bummed! Sadly I really believe the corporate mindset at MS is that everyone using Outlook is using it with Exchange. If that were true, then of course there would be no need for Outlook sync. Everyone not using Outlook with Exchange is using web based PIM; Live, Google, etc. That is covered fairly well. (I've migrated to Live, syncing both my Outlook and phone to it independently) Between those two camps, 95% of customers are covered. 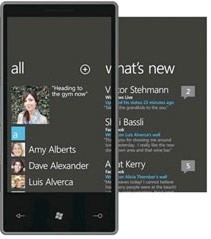 All of these ideas for updates to WP7 are good- except the unified inbox. If Micrsoft adds that, it should be as an option only so those of you who want all your e-mail in one place can be happy. I most certainly do not want my three e-mail accounts all in one inbox. I don't think I am alone. Somewhere in all of the pre-launch publicity there was a comment from a Windows Phone executive that their market research showed most customers did not want a unified inbox and that is why it wasn't included. It certainly makes sense as an option. I'm with you... I have separate email accounts for a reason and don't want to see them all in one Inbox...unless of course, the Inbox itself could be separated and all 'outgoing' replies, etc. could be associated with the appropriate email account to which it was sent -- not to my phone.